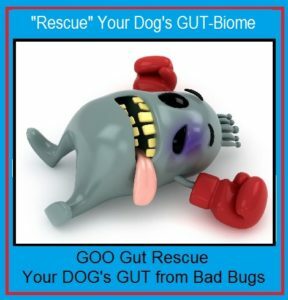 My Dog has Crohns, and GOO Gut Rescue has been keeping him Healthy! So glad we found Gut Rescue, it has literally been a Lifesaver ! Thank You for following up on my Animal’s Health / GOO Gut Rescue Progress. He has Crohn’s Disease, and GOO Gut Rescue really helps prevent Flare Ups. If we watch his Diet, and give him GOO Gut Rescue daily, We avoid using the Prednisone most of the Time. This is the GOO Best!!!! My Red has Crohns and this Helps Him So Much, rarely / less and less needs Steroids due to the GOO Gut Rescue ! Just to follow up on my son’s Mountain Dog. He is doing fantastic on the GOO Gut Rescue. Because of all of the antibiotics and steroids he developed many warts in his mouth and on his nose. He has been on the Gut Rescue for a couple of weeks now and the mouth warts have almost disappeared. The large wart on his nose is shrinking and going away. I cannot begin to thank you enough for all that did in helping Tyrion regain a healthy immune system. We / Tyrion will be following up with Doggy GOO for the future and I will be ordering some Doggy GOO for my two Retrievers. Thanks again for this wonderful GOO product. and $$$ done …my Doctor”s” ended up putting him on an Antibiotic powder (Tylan powder) twice a day, as well as on a special prescription Dog Food called D/D Duck. Even on the special food, He threw up at least 2 times a week. time became very dehydrated & more weak. Even to the point that I had to give him fluids under the Skin every time this happened. Needless to say, my husband and I didn’t know what to do for this poor Dog ! the Veterinary Bills were becoming more & more $$ overwhelming. In a “final” attempt, we made the decision to take the Dog off of all these products. We switched him to the holistic grain free dog that our other 3 yr. old Doberman was on. We even ( Sadly ) agreed, that if this action did not turn things around, we felt ( in the interest of the Animal’s Quality of Life …despite our true sadness to see our beautiful animal suffer so ) we would put him out of his misery if this did not change things. In addition to our 7 yr old, our other Dob Dog was having Skin problems. So we took him to a Veterinary Dermatologist, who mentioned a funny named company called Healthy GOO, and recommended an equally funny named product called Doggy GOO. Well his issues with his Skin responded to this GOO extremely well. After listening, he thought their new product GOO Gut Rescue might be worth a try. Well, it has been at least 8 Weeks + now and my 7 Yr Dog has not been Sick once ( Fingers & PAWs Crossed ). Now he is playing and running around with the 3 yr. old like he was the same age. Most of all, he is a very Happy Dog now. All said and done, I would recommend this product to anyone who is having problem with their dog vomiting and just not wanting to eat! Now my 7 yr old is Happy .. his 3 yr Buddy has his playmate back again… my husband is happy .. and so am I ! While it may seem funny to say … Thanks GOO ! I have my beautiful Dob Back ! — I got my Dob Back !